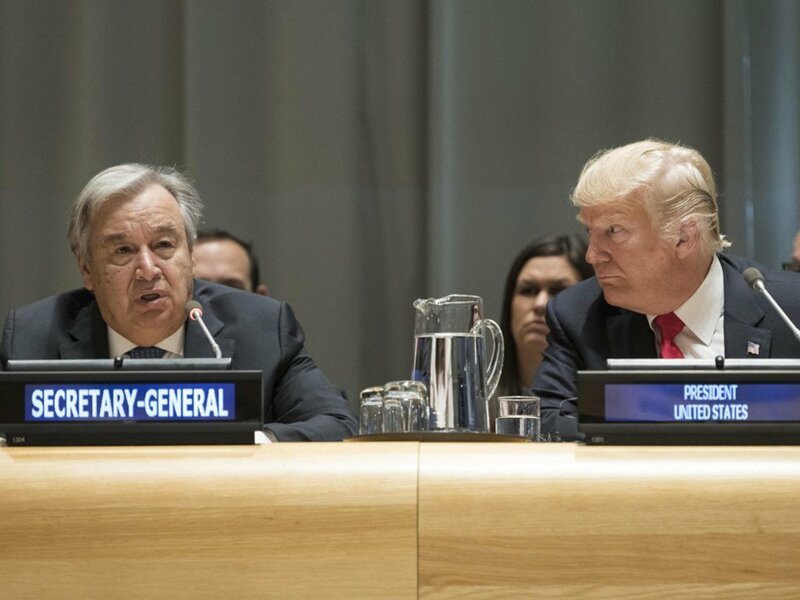 Secretary-General António Guterres (left) and US President Donald Trump (right) at a High-level Event on Counter Narcotics, convened by the United States, at UN Headquarters in New York, on 24 September 2018. “All of us have stories” and “it is our duty to act – and act now,” underscored the UN chief. He highlighted that he had lost a friend to drugs “at an unbearably young age, and also described how his sister had spent many years working as a psychiatrist at a drug treatment centre in the Portuguese capital, Lisbon. “Some 450,000 people die every year from overdoses or drug-related health issues,” he underscored, adding that in recent years, “some 31 million people around the world” required drug-addiction treatment. Non-medical use of tramadol in parts of Africa and the Middle East is threatening communities that are already fragile. And the United States is in an “utterly heart-breaking” opioid crisis, according to the UN chief. He voiced concern that only one-in-six people who need drug-addiction treatment receives it, and for women, the figure is even higher. Mr. Guterres urged “strong action in two areas” to tackle this issue. Firstly, he underscored the urgency to “crack down on drug trafficking and those who profit from human misery,” specifically by denying them safe havens and better cross-border cooperation; improving intelligence-sharing and analysis across drug supply chains; and targeting the links between drugs, corruption, arms, human trafficking and terrorist networks. The Secretary-General explained that this was the policy he employed as Portugal’s Prime Minister two decades ago, when the country had some of Europe’s highest drug abuse death rates and the highest rate of HIV amongst injecting drug users. Moreover, he said that drug consumption dropped “significantly, particularly among youth,” drug users declined by 50 per cent, and drug-related infectious diseases and the number of people overdosing also plunged. “National priorities may differ, but the global community shares a common goal: to protect people’s security, health and wellbeing,” he emphasized. Mr. Guterres assured that the UN stands behind the UN Drug Control Conventions and the 2016 UN General Assembly Special Session outcome document. 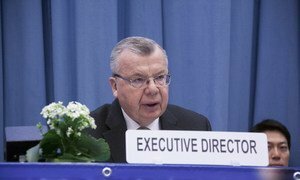 "The United Nations system – and I personally – stand ready to support governments in meeting the challenge of the world drug problem,” he asserted. “Failure is, indeed, not an option. Together we will succeed. We will never give up,” concluded the Secretary-General. US President Donald Tump presents his Global Call to Action on the World Drug Problem during the high-level event on countering narcotics at UN Headquarters. US President Donald Trump, hosting the event, called Mr. Guterres a "great friend," noting that he was doing a "wonderful job" in a "very complex” situation, adding that the UN’s “tremendous potential” was “slowly but surely” being met. The US President stressed the need to combat drug addiction and stop all forms of trafficking and smuggling. Citing the 2018 World Drug Report, he pointed out that cocaine and opium production have hit record highs, noting that global drug-related deaths have gone up 60 per cent in 15 years. Flagging the link between illicit drugs and organized crime, illegal financial flows, corruption and terrorism, he stressed: "It is vital for public health and national security that we fight drug addiction and stop all forms of trafficking and smuggling that provide the financial lifeblood for vicious trans-national cartels." “If we take these steps together, we can save the lives of countless people in all corners of the world,” said Mr. Trump. “The United States looks forward to working with you to strengthening our communities, protect our families and deliver a drug-free future for all of our children. Inclusive partnerships are essential to addressing drug challenges and achieving the Sustainable Development Goals (SDGs), according to the top United Nations panel dealing with all aspects of narcotic drugs.